I want to thank all of my readers who have so generously donated to A Menu For Hope this year, and while it is true that we have together broken last years record of approximately $62, 000.00, we’d like, in the last few hours of the campaign, send as much as we possibly can to the schoolkids of Lesotho. There are some woefully neglected prizes with some great odds of winning out there: Pim breaks down some of them, and on her blog, there are links to more extensive lists breaking down the odds on prizes regionally. These links are on the right hand side of the front page of her blog–under A Menu For Hope Daily, which lists the up-to-the-minute donation total. It is amazing to me to see generosity in action among food blog readers: you all are a wonderful bunch of people! Thank you all, from the bottom of my heart. Oh, and while you are at it–keep playing Free Rice. With Free Rice, the bookish cook’s hunger for vocabulary can help feed poor people around the world. 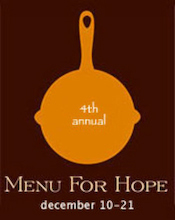 It is a great way to extend the generosity of A Menu For Hope all through the year. Remember, the more people who play, the more people who win a full dinner plate through the United Nations World Food Program. Alas, all the prizes that you have a good chance of winning are set in London, France or the East Coast. However, I do not feel guilty. Our church – along with Gilde Memorial – feeds thousands over the holidays. Today I was off helping sort the clothing collections for St. Anthony and donated a bunch of my larger sized clothes (I’ve gone done three sizes since 2004) along with money for them to buy warm coats for kids. It’s cold even in SF. How wonderful to have surpassed last year! Well done to the bloggers. And, maybe I’ll be a lucky winner…. Please don’t tell me to play more free rice…I’m so addicted to it now mon mari is threatening a mutiny. How can something so simple make the time go so fast….